Ever since the first day of October, I have been keenly tuned to pick up horror book recommendations. I find when I put out a blanket request for horror recommendations I get a list of books which are great, but old, when I want to read new ideas and plots from different authors. Running a Google search of Top Horror Reads 2015, brought me to this article in Paste Magazine, which again does contain some very good reads but not many current ones. I would not dare to knock the institution of Stephen King or Clive Barker, but I would like to experience a broader spectrum of horror reads, preferably without vampires and werewolves. My first port of call was Goodreads, where there is already a section to vote for your favourite horror. 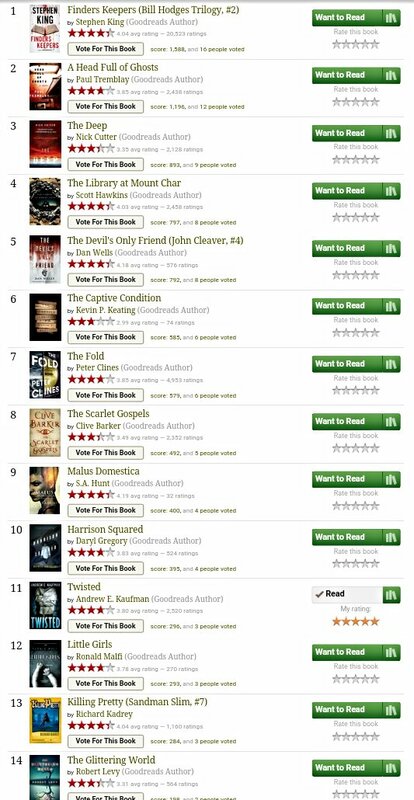 Looking through this list I have only read one of the books that are receiving votes, Twisted by Andrew E. Kaufman. So I went through the list and randomly picked three books to read. I hope using this list for recommendations allows me to confidently vote on books in the horror genre this year. My choices were limited by the fact that a number of the books on this list are surprisingly not available on Kindle. I hope to bring a number of horror reviews here leading up to Halloween, and officially declare Halloween season open on this blog. I didn’t realise until I started browsing nust how much I have neglected this genre. If you have discovered any horror reads you think I must absolutely read (please no vampires and or werewolves), I’d be delighted to hear from you. I’ve been digging into darker fantasy and horror as of late and have encountered some great reads. From your side of the pond, Charles Stross’ novella Equoid is both brilliant and highly disturbing. British Unicorn Infestation–really. It has a detective noir cadence to it. Another novella is the sci-fi horror “The Wreck of the Charles Dexter Ward“ by Elizabeth Bear and Sarah Monette. It nods its head to Mary Shelley. While they can be acquired elsewhere, both of these novellas were included in the anthology New Cthulhu 2: More Recent Weird ed. Paula Guran [Prime Press]. Ryan Lanz’ Unknown Sender is a very disturbing psychological horror that taps into some dark urban legends. No supernatural elements or creatures involved. Finally, I’ve been enjoying the new series by Michael Robertson, The Alpha Plague. [and The Alpha Plague 2,The Alpha Plague 3] All came out this summer, #3 this week. They are serial novels spelling out the first days of a rage-style pandemic [ala 28 days later] in the London area. The third book smartly brought in political intrigue reminding me of All the Old Knives. The 4th book is in the works. Thank you, I look forward to reading these. These two books aren’t new but they are among the most frightening I’ve ever read, in addition to being just really good writing and stories. LOST by Gregory Maguire and THE VIRGIN SUICIDES by Jeffrey Eugenides. Both chilling. Happy Hallowe’en! It’s also an older book, maybe you’ve read it, but I found The Shining – Stephen King to be quite haunting. Thank you, I have read it and the sequel Dr Sleep. Ooh. I haven’t read the sequel. Will look it up! It’s a very different read to The Shinning but I liked it. The gold standard for horror is the ghost stories of M.R. James, many of which appear in various anthologies. If you can find a creepier horror story than “Oh, Whistle, and I’ll Come to You, My Lad,” that’s more than I can do. Will look into MR James, thanks Lee. The Exorcist is a great book to read around this time of year – it’s definitely creepy, in a good way. I have never got round to reading The Exorcist, despite watching it multiple times. I haven’t watched it for some years but I do like to watch horrors.